Blush has been a hot color designers have used to bring a soft and feminine feeling to a space. Next season, there’s a new color in town…lilac! This slightly less traditional shade still elicits that same feminine feeling without making the space feel girly. But get ready for lots of black and white too. This classic color combination is taking center stage and I love it! How gorgeous would this bold look on a colored accent wall?! And these that I shared during my Design on High Point Instagram takeover are so fun. Wood grain is also becoming more prominent, especially in table tops. It’s also making an appearance in chairs, desks and night stands. The wood grain pieces from the and collections were amazing! – Lighting fixtures can be equally illuminating and a sculptural art piece. These gorgeous, hand-blown glass pieces from SkLO are exactly that. They’re simply elegant! 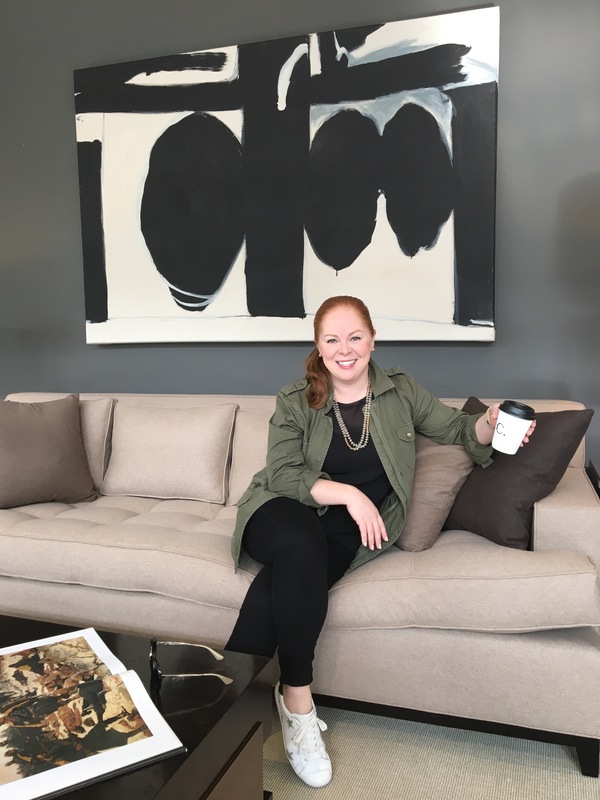 – It was such fun visiting their temporary showroom – the move into their new and improved showroom by next market, I believe – and I loved their collection from . – Congratulations Capel Rugs on your 100th anniversary! It’s proof that keeping things in the family is a key to success! – I toured their new introductions which, of course, included lots of black and white pieces. I spotted a beautiful black and white floral inlay table that may just find a place in our house…so stay tuned! – During my visit at Baker, I chatted with Thomas Pheasant about his . It’s a beautiful interpretation of classic design in a contemporary fashion. And he his eye for detail is incredible! – I just had to Instagram this beautiful lilac tufted bench…what a showstopper! It was the perfect match for this …the perfect piece for showing off all your favorite books. – I toured the new lines with their marketing director and fell in love with their new Italian collection. They had several lilac and black and white pieces which of course caught my eye. But the nesting tables from the collection were quite stunning as well. And what a gentleman! – At Made Goods, I spotted a gorgeous burl wood desk. Though burl wood may be known as “irregular wood”, this desk is anything but. It’s absolutely stunning! – This cane-front chest comes in a few colors. It would be perfect as bookcase or bar area for a man’s study or a library. – Caned furnishing can feel textural and even a bit casual, but when you give it a fabulous metallic finish and a leather seat it turns into the most gorgeous chair! 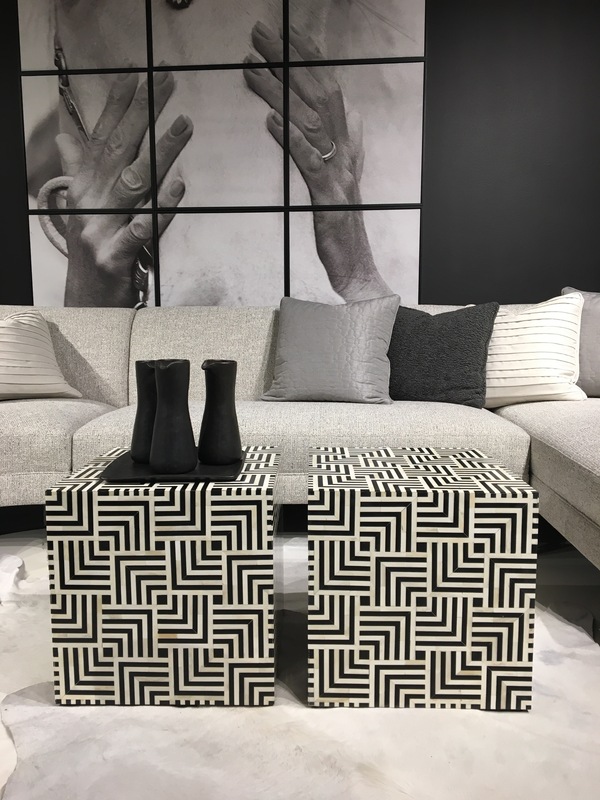 And this three-piece geometric black and white coffee table is such a fabulous piece! – I absolutely LOVE the new …the quintessential example of how simple design equals perfection. How stunning is this ?! And this classically modern bedroom set from shows how the littlest details make all the difference. But in addition to visiting all the showrooms, one of the fun parts of High Point Market is meeting the . These are industry leaders chosen to showcase the latest styles at High Point Market. I had the honor of being a Style Spotter in 2016 and thoroughly enjoyed seeing everyone again at the Style Spotters Reunion happy hour. It’s always such fun to catch up with colleagues and connect with industry leaders. And this year I had the opportunity to interview with , a luxury home furnishings company with the best accessories, , a beautiful and high-performance textile manufacturer, and with , a publication for design professionals. It was such a pleasure speaking with everyone…they’re such incredible talents! High Point Market is always such a fun experience and I always leave feeling full of new inspiration and excitement about things to come in the design world! Want to check out what we discovered during our spring trip earlier this year? Don’t forget to check out the recap! Previous ArticleProject Reveal: Memorial Park Modern Home!